SOME MAY SAY OUR STORY BEGINS ON THE CATTLE RANCH BUT WE LIKE TO THINK IT BEGINS SOMEWHERE A LITTLE DIFFERENT. 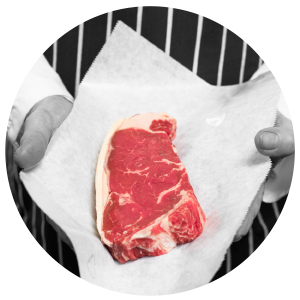 BLACK APRON BEEF IS TRULY DEFINED BY THE BUTCHER, HIS CLEAVER AND THE SIGNATURE BUTCHERS APRON. OUR SKILLED CRAFTSMAN STRIVE TO PROVIDE A PREMIUM PRODUCT THAT WE BELIEVE BOTH STANDS OUT IN THE CANADIAN MARKETPLACE AND IS A PRODUCT THAT CUSTOMERS CAN TRUST. ENTICING YOUR INNER FOODIE WITH ITS MOUTH WATERING TASTE AND PREMIUM ATTRIBUTES, BLACK APRON BEEF IS A CULINARY EXPERIENCE LIKE NO OTHER. 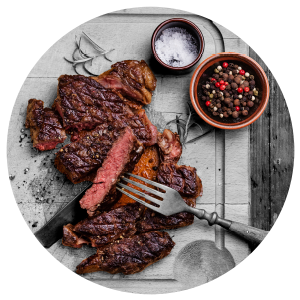 ONLY THE FINEST BLACK ANGUS CATTLE ARE SELECTED FOR OUR BUTCHERS, SO YOU CAN REST ASSURED THAT YOU ARE RECEIVING TOP QUALITY BEEF EVERY TIME. OUR BUTCHERS HIGH STANDARDS DO NOT APPLY TO JUST A FINAL PRODUCT HOWEVER. WHEN IT COMES TO RAISING OUR ANIMALS, WE PRIDE OURSELVES ON PROVIDING THEM THE BEST OUR CANADIAN LAND HAS TO OFFER. 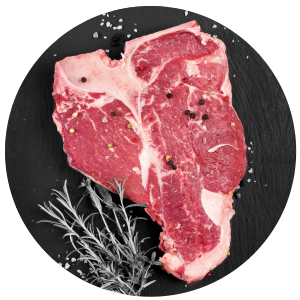 FREE TO ROAM THE PASTURES OF WESTERN CANADIAN RANCHES AND RAISED WITHOUT THE USE OF HORMONES OR STEROIDS, BLACK APRON BEEF HAS PREMIUM ATTRIBUTES THAT ANY CHEF, FOODIE OR ‘CARNIVORE’ CAN STAND PROUDLY BEHIND.